About a month ago, I was out at a Toys "R" Us and stumbled across this- a retro Teenage Mutant Ninja Turtles Michelangelo re-release. With the current generation being reintroduced to the TMNT because of the great new Nickelodeon TV show and toys, it's wonderful to see the toy companies putting effort into appealing to the older audiences that grew up with the original Turtle toys. Playmates (and Nickelodeon) have re-issued these nostalgia-infused vintage figures early enough for Christmas, and this particular one was a gift I bought for myself. It comes complete with loaded childhood memories of losing half of the weapons from the cut-apart plastic rack that doubles as a stand, which I didn't know as a kid. Unfortunately, Mike's nunchucks still break fairly swiftly once removed from it. 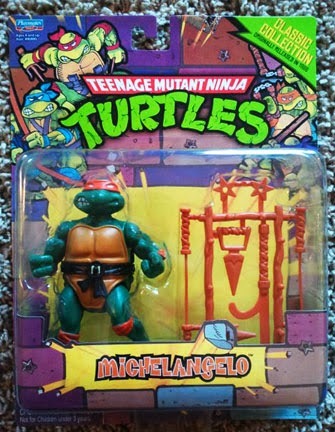 So this re-issue contains the original 6 action figures from way back in 1988 (Leonardo, Michelangelo, Donatello, Raphael, Splinter, and Shredder), the Turtle Party Wagon, and a massive Raphael M.E.C.H. suit. Dude- I also recall not ever being able to get the Shredder to balance properly due to his strange stance. ...GAH!!! I WANT ALL MILLION OF THEM!! !